Everyone deserves a family and every family should be secure under the law. Reproductive Legal Counsel provides legal counsel to individuals, agencies, and professionals engaged in family building and Assisted Reproductive Technologies including Egg Donation, Sperm Donation, Gestational Carriers/ Surrogacy, Reproductive Contracts, Parentage Orders, and Adoption. Elizabeth Howard Small, Esq. is a compassionate and tenacious attorney with a wealth of knowledge and experience in the field of Reproductive Law. Elizabeth specializes in building and securing all families. Her clients seek to clarify their rights and responsibilities and to protect themselves and their families. Elizabeth has worked at the highest levels of private practice, managing multinational complex litigation for Fortune 100 Companies. Her calling is Reproductive Law, and she is pleased to use her legal acumen to guide individuals, agencies, and families through the labyrinth of choices during their most precious and important life decisions. Prior to her work as an attorney in private practice, Elizabeth co-founded a nonprofit organization, Demeter Speaks, seeking to promote access and dialogue regarding assisted reproductive health technologies. Elizabeth served as a chapter Co-President and Regional Director of Law Students for Reproductive Justice, and in that capacity, organized conferences and talks in the field of Reproductive Law, and worked toward building Reproductive Law into law school curriculums. Elizabeth received her J.D. from American University, Washington College of Law with the Outstanding Law Student Award from the National Association of Women Lawyers. She served as Publication Editor for The Modern American, and wrote about Preimplantation Genetic Diagnosis. Elizabeth received her undergraduate degree from the College of the Holy Cross, with an A.B. in Philosophy. 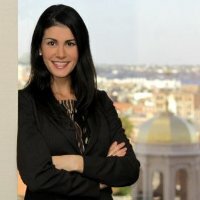 Elizabeth is an active member of The American Bar Association, The Women’s Bar Association, The Massachusetts Bar Association, and The Boston Bar Association. She is also a professional member of Resolve. Elizabeth teaches Bioethics and Health Care Ethics. Elizabeth is a mother to two daughters. She has two constant reminders of the desire to build a family and the need to protect it.